The annual Healthcare Information and Management Systems Society (HIMSS) conference, a sprawling event with 45,000+ attendees from around the world, recently descended on Las Vegas for a week of education and networking. On the expo floor, our team was fortunate to interact with a staggering number of IT attendees, from first-time admins to seasoned CIOs. Getting to know a bit about each company that swung by was a highlight of the week and provided a valuable window into the larger healthcare IT ecosystem. Now that we’ve all had a week to dig through the backlog of email that inevitably piled up during HIMSS, I compiled our team’s biggest takeaways from the event. From high-level changes affecting the entire healthcare industry, to tactical shifts that nudge more teams toward mobile device management (MDM), our most difficult challenge was narrowing our list down to just three points! The HIMSS audience is a fascinating combination of clinicians and tech leaders interacting with the same goal in mind: improve the patient experience by leveraging technology. “To take a page from the book Crossing the Chasm,” said Aaron Hix, senior manager of global business development, Jamf, “Jamf has moved from the Technologist section of the adoption curve to the Visionaries phase.” In other words, Jamf continues to see wider adoption among executives who previously did not consider MDM. Four days of conversation at our booth certainly support that statement. There was no shortage of discussion about how to begin using MDM software for the first time to improve the user experience. “Attendees were hungry for a way to use technology to help the patient feel more involved and relaxed during care,” said Chris McSorley, senior enterprise account executive, Jamf. High-level executives asked pointed questions about the value of MDM in a modern healthcare facility and next steps they could take to learn more or get started on a path to adoption. 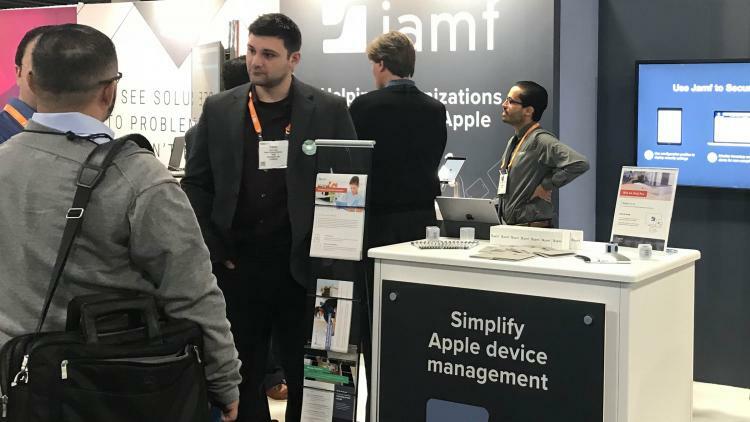 From iPads used as a platform for demos to attendees using iPhones to swap contact information, Apple devices were ubiquitous at HIMSS this year. It was encouraging to see firsthand how healthcare organizations are taking a fresh look at Apple devices to solve business challenges. With Apple devices at the center of the patient experience, healthcare providers can engage, educate and entertain patients — transforming the bedside experience in powerful new ways. It was also interesting to see the different combined service and application offerings vendors were deploying using the Apple platform. Pre-packaged solutions make for a compelling offer for physicians and clinicians that have specific goals in mind but struggle to find the right avenues to get there. One of my favorite conversations of the week was with a small specialty clinic that’s looking to deploy iPads and a specific application for the first time. The organization had some exposure to technology in the past but has yet to embrace hardware as a way to make their patients more comfortable during care and more likely to return afterward. Seeing small and medium-sized healthcare organizations begin to take up the banner of integrated technology solutions is very encouraging and indicates the value proposition of Apple and Jamf has only grown as time has gone on. As you can tell, HIMSS is a week unlike anything else in healthcare IT. With so many people to meet in such a compressed timeframe, there is no shortage of valuable takeaways from the event. If you’re already planning a trip to HIMSS 2019, be sure to set a reminder to look for our booth. We’ll see you there! If you’re considering leveraging technology to improve the patient and back office experience, consider taking a look at Jamf Pro or Jamf Now to help make that vision a reality. If your environment calls for enterprise-level features and functionality, Jamf Pro is for you. If the basics are exactly what you need, start managing your devices today with Jamf Now.